Despite his passion for the game, Dwyane Wade was not much more than an average basketball player as a youngster. Initially, he made a bigger impression on the football coaches at H.L. Richards High School in Oak Lawn, on the South Side of Chicago, than he did on basketball coach Jack Fitzgerald’s squad. A gritty cornerback and wide receiver, Wade showed promise on the gridiron, but he couldn’t kick his obsession for basketball. He idolized former Chicago Bulls star Michael Jordan. So he spent his second season with the Bulldogs on the sophomore basketball team. Determined to earn time on the varsity squad, Wade worked out rigorously before his junior year in the summer of 1998, improving his ball-handling skills and his outside shot. Wade’s body cooperated, too, as he shot up four inches to six-feet, two-inches tall. Always a tenacious rebounder, Wade now had the size and skills to excel in all phases of the game. Recognizing an emerging star, Fitzgerald made the junior his go-to guy. Wade did it all for the Bulldogs. If Richards needed to break the press, Fitzgerald put the ball in Wade’s hands. If the team needed a hoop in close, Wade got the ball in the post. For the year, he averaged 20.7 points and 7.6 rebounds, and opened eyes all around Chicagoland. He responded to the extra attention with an even more marvelous senior season. Wade went for a double-double almost every game that year, averaging 27.0 points and 11.0 rebounds while leading his team to a 24-5 record and a berth in the round of 32 (the title game of the Eisenhower Sectional) of the 256-team 1999-00 Illinois High School Association (IHSA) Class AA State Championship (though without the acclaim of former Heat player Patrick Beverley, who made it all the way to the final four with his Marshall high school team in 2005-06, or Derrick Rose, who won it all with his Simeon high school team in both 2005-06 and 2006-07). Wade set school records for points (676) and steals (106) in a season that year. The college scholarship offers didn’t come pouring in, though. Wade dreamed of playing for Michigan, inspired by the Fab Five. But some of the schools looking at Wade, Michigan included, stopped looking when his first ACT score was low. Fearing he wouldn’t be able to cut it academically, most backed off. Due to his academic problems, Wade was recruited by only four college basketball programs for the incoming class of 2000 – DePaul, Illinois State, Bradley and Marquette. Each remained interested in Wade even though he struggled to get his ACT up to the qualifying standard. In three tries, he never did. The Golden Eagles nonetheless accepted Dwyane as a partial qualifier, meaning he could practice with the basketball team as a freshman but not suit up for games due to a lack of compliance with the NCAA’s Proposition 48. Academically ineligible for play during his freshman year at Marquette, Wade sought tutoring to improve his writing skills in order to regain eligibility. When he became eligible to play the following year (2001–02), he led the Golden Eagles in points (17.8), rebounds (6.6), assists (3.4), steals (2.5) and blocks (1.1), and guided the team to a 26-7 record and its first NCAA tournament berth since 1997. Wade had displayed not only perseverance but also toughness, playing the latter half of the season through injury. After the season, in March 2002, Wade underwent arthroscopic surgery on his left knee to deal with a small tear in his lateral meniscus. The torn portion of the meniscus was removed, and Wade was back on the court training for his junior year within weeks. “Everything went well and Dwyane’s knee, after initial rehab, should be completely healed,” Marquette trainer Steve Condon said at the time. For a long time, Condon was correct. A stellar junior season followed. In 2002–03, Wade led Marquette in scoring again with 21.5 points per game, and Marquette won the school’s first and only Conference USA championship with a 27–6 record. That season Wade led the Golden Eagles to the Final Four, the school’s first appearance in the Final Four since winning the 1977 national championship. After the season, he was named to the All-America First Team by the Associated Press. Then came a number five selection in the 2003 N.B.A. Draft after he forwent this senior year of college, then what has become a Hall-of-Fame career for the Miami Heat. Each knee has two menisci, which are C-shaped wedges of fibro-cartilage positioned between the femur (thighbone) and the tibia (shinbone), one on the medial (inside) compartment of the knee and the other on the lateral (outside) compartment of the knee. The mensci serve several functions. They safely transmit loads across the knee, the most weight-bearing joint in the human body. The forces across the joint can reach up to two to four times your body weight while walking and up to six to eight times your body weight while running. The lateral meniscus bears more of the load than the medial meniscus. They also act as shock absorbers that protect the femur and tibia from constantly pounding into each other, thus maintaining the health of the articular cartilage that resides at the ends of both of these bones. Articular cartilage is what prevents bone-on-bone interaction as the knee is flexed and extended, called osteoarthritis, which can be debilitatingly painful. Finally, they act as secondary stabilizers for the knee (in conjunction with the ligaments which connect the tibia and femur), protecting it from abnormal front-to-back motion. Proper treatment of a meniscal tear is therefore vital, in order to maintain the structural integrity of the knee and to preserve the health of the articular cartilage. There are two recognized surgical treatments for meniscal tear: repair and removal (i.e., meniscectomy). Years ago, if a patient had a torn meniscus, and surgery was necessary, the entire meniscus was removed. These patients actually did quite well after the surgery. The problem was that over time, the articular cartilage on the ends of the bones were worn away more quickly, due to the loss of the cushioning effect of the menisci and the diminished stability of the knee joint. When arthroscopic surgery (a minimally invasive surgical procedure in which an examination and treatment of damage to the interior of a joint is performed using a tiny fiber optic camera and tools that are inserted into the joint through two or more tiny incisions) became more popular, more surgeons performed partial meniscus removal – called a partial meniscectomy. A partial meniscectomy is performed to remove only the torn segment of the meniscus. This type of procedure has a better long-term prognosis than a full removal, particularly if the tear is relatively small, but problems can again creep up down the road. In recent years, given the critical function of the meniscus, there has been great interest in avoiding meniscectomy altogether wherever possible, and repair has grown in popularity. Despite recent advances, however, a large proportion of meniscal tears remain irreparable, and partial meniscectomy is often necessary, regardless of the recognized consequences. The decision to repair versus remove is generally based on whether the mensical tissue has a chance to heal. The ability of meniscal tissue to heal is closely related to its blood supply. At birth, the whole meniscus is vascularised (supplied with blood vessels). However, an avascular area soon develops in the inner circumference of the meniscus, and in the second decade of life blood vessels are seen only in the outer third. Successful repair of meniscus tears therefore depends to a large degree on the age of the patient as well as the size, direction and location of the tear. Tears at the outer edge of the meniscus (the “red zone,” red for blood) tend to heal well. Blood supply to tears that extend into the center of the meniscus (“white zone”) is questionable, and surgical repair of a tear in this zone may not heal well. The necessary surgical procedure is often not able to be determined until the surgery has begun. Through the use of the arthroscope, the doctor will assess the damage and determine whether he or she believes there is sufficient blood supply at the site of the tear to promote healing. If so, the loose cartilage will be stitched back together and allowed to heal. If not, the torn cartilage will be removed. Chris Paul, for example, was originally going to have his torn left lateral meniscus repaired in February 2010, but once the tear was viewed by renown orthopedic surgeon Dr. James Andrews, partial removal was determined to be the best course of action. A doctor can choose to be aggressive or conservative in his course of treatment. A repair can always be attempted, but the meniscus may not heal. Many times the correct course of action is clear, other times less so. For example, Dr. Andrews attempted to repair a lateral meniscus tear in Chase Budinger’s left knee in November 2012, and when that failed, subsequently removed it in September 2013. A repair approach has a significantly longer healing time – many months in fact, as Derrick Rose and Russell Westbrook can attest to – but provides a far better long-term prognosis if successful, with no significant long term consequences in the vast majority of cases. A removal approach has a far quicker healing time – often a few weeks or even just days, as Blake Griffin and Metta World Peace can attest to – but future problems are much more likely to arise. Partial loss of a meniscus can have damaging effects on a knee, leading to serious longer-term consequences. The increased contact between the tibia and femur within the knee after partial loss of a meniscus can overload the articular cartilage that resides on the ends of these long bones, causing the surface of the articular cartilage to rub away, leading to necrosis and eventually complete loss of the cartilage layer. The resulting bone-on-bone interaction, loose cartilage and excess fluid buildup in the knee causes severe pain, soreness, swelling, bruising and loss of range of motion. This is what Wade will be dealing with for the rest of his career. The symptoms can be managed with rest and rehabilitation, but the underlying condition is both chronic and degenerative. Many years down the line, Wade is likely to face knee replacement, which is a very common operation for ex-athletes (1). Given his young age and the small size of his tear, Wade apparently feels that he was a candidate for a repair but, on advice of his doctor, he chose a partial removal based upon incomplete information. It is a decision he regrets to this day. For many years post-surgery, Wade’s knee remained relatively healthy. The tremendous explosiveness he generated from his knees, in fact, led the Heat to its first ever N.B.A. championship in the 2005-06 season. However, due in part to the stresses of his profession, time caught up to him. Wade’s meniscal-related issues have been magnified in recent years, and have perhaps perpetrated additional and even more problematic knee ailments. During the 2006-07 season, he missed 23 games with a dislocated left shoulder before returning just before the playoffs, but as the postseason began, it was the left knee – not the shoulder – that caused him the most pain. Wade was being bothered by patellar tendinitis in the knee, a commonly recognized issue for athletes who do repetitive jumping, for which reason it is often referred to as “jumper’s knee,” and increasingly likely after meniscectomy (2). Patellar tendinitis is an inflammation or irritation of the patellar tendon (actually a ligament), the cord-like tissue that joins the patella (kneecap) to the tibia (shinbone). It is a common overuse injury which occurs when placing repeated stress on the patellar tendon. The stress results in tiny tears in the tendon, which the body attempts to repair. But as the tears in the tendon become more numerous, they cause inflammation and a weakening of the tendon structure. Tendons are strong bands of tissue that connect muscles to bones. The tendons in the front of the knee are the quadriceps tendon and the patellar tendon. 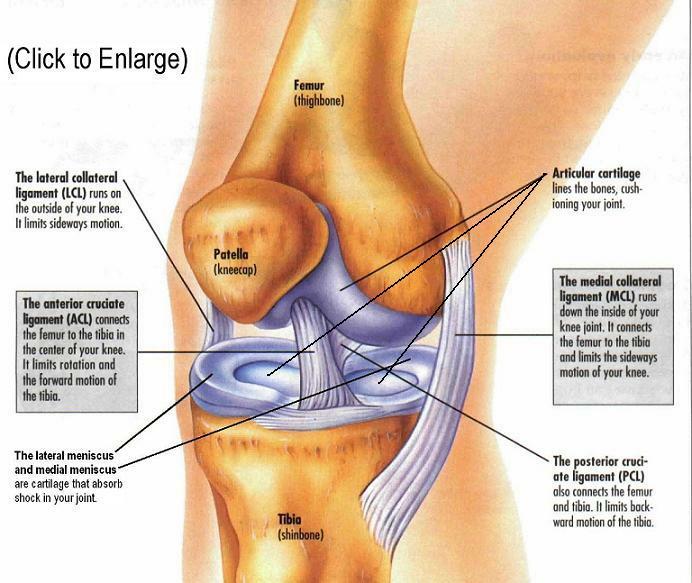 The quadriceps tendon connects the quadriceps muscle to the top of the patella. The patellar tendon connects to the bottom of the patella and attaches to the top of the tibia (3). When the knee is extended, the quadriceps muscle pulls on the quadriceps tendon, which in turn pulls on the patella. The patella then pulls on the patellar tendon, which in turn pulls on the tibia and allows the knee to straighten. In jumper’s knee, the patellar tendon is damaged. This causes pain and weakness in the knee, and leads to difficulty straightening the leg. Common symptoms of jumper’s knee include pain directly over the patellar tendon; stiffness of the knee, particularly while jumping, kneeling, squatting, sitting, or climbing stairs; pain when bending the knee; pain in the quadriceps muscle; and weakness in the leg or calf. Although most sufferers of this condition can be treated conservatively, occasionally the little tears in the tendon enlarge to create an area of dead tissue within the tendon. The pain became so severe for Wade that he first turned to acupuncture in April 2007, in preparation for the 2006-07 playoffs. After the playoffs, in May 2007, he underwent debridement surgery to remove the dead tissue and repair his left patellar tendon. Eventually, Wade was shut down for the final 21 games of a disappointing 2007-08 season, on account of the same pain. In pursuit of lasting relief, in March 2008, he turned to shock wave therapy utilizing SanuWave’s OssaTron device. The OssaTron, one of five extracorporeal shock wave therapy devices FDA approved for the treatment of patellar tendinitis, emits high-energy shock waves similar to those used to break apart kidney stones in an attempt to increase blood flow and stimulate healing of the affected tissue. The non-surgical procedure lasts about 30 minutes. Wade went on to have perhaps his best ever N.B.A. season in 2008-09, playing a career-high 79 regular season games, while leading the league in scoring at 30.2 points per game and averaging 7.5 assists, 5.0 rebounds, 2.2 steals, and 1.3 blocks per game. He finished third in league MVP honors, presumably due purely to an inferior team record of 43-39 during the team’s tear-down period in preparation for the Big Three era. Wade’s similarly-spectacular 77 regular season (and five utterly amazing postseason) games during the 2009-10 season, as well as his All-Star Game MVP performance, were enough to convince LeBron James and Chris Bosh to join him in Miami. 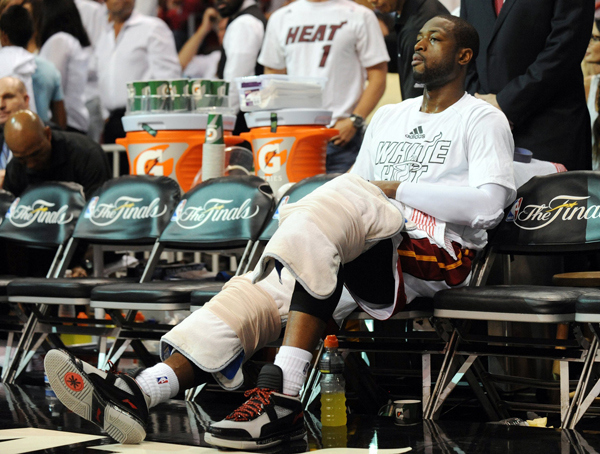 After nearly two more seemingly healthy seasons, Wade’s knee pain again worsened toward the end of the 2011-12 season. Never was this more noticeable than during the 2012 N.B.A. playoffs, when the pain forced him to grit through some wildly inconsistent performances. While admitting nothing publicly, he was dealing with severe pain and swelling in the knee. The damage inflicted on the articular cartilage in the knee, endured by the constant pounding over the course of Wade’s career and perpetuated by the partial removal of his meniscus, was causing the joint to break down. The swelling came from a build-up of excess fluid inside the joint. The knee joint contains small amounts of a thick, gel-like substance known as synovial fluid that helps protect joint tissue. In normal amounts, this fluid lubricates the joint, reduces friction between the articular cartilage during movement, and nourishes the cartilage. When the joint is injured, the synovial membrane becomes irritated and secretes excess fluid that collects inside the joint. The excess fluid causes pain and a loss of mobility. In May 2012, during the Eastern Conference Semifinals against the Indiana Pacers, Wade had a minor procedure to drain his knee of the excess fluid through the use of a syringe. But that was only a temporary solution which provided only short-term relief. Unless the underlying problem is resolved, excess amounts of fluid will return. Therefore, shortly after upending the Oklahoma City Thunder in the N.B.A. Finals, Wade went on to have a third arthroscopic procedure on the knee, this time to clean it out. Much like in 2008-09, Wade was having a rejuvenated start to the 2012-13 regular season. But things changed dramatically in March, when he incurred three separate bone bruises to his femur (thighbone) that essentially surrounded his entire kneecap, this time to what was previously thought to be a structurally sound right knee. The first of Wade’s bruises occurred on March 6, when he took a hit in a game against the Orlando Magic. With the Heat in the midst of a historic 27-game winning streak, rather than rest, he played through the pain. Another blow to the knee came on March 18 against the Celtics in Boston, resulting in a second bruise. A third bruise occurred at New Orleans against the Hornets on March 29. The bruises were a completely separate issue that had no apparent connection to any past left knee issues. It was, however, some of the most severe pain he had ever experienced, and rendered him almost completely ineffective for the rest of the regular season and throughout the playoffs. The term “bone bruise” perhaps makes the injury seem less serious than it is. People often think of a bruise as a black-and-blue mark on the skin, which is often nothing more than a minor nuisance. But bones can also be bruised. In fact, bone bruises can be quite severe and extremely painful. They’re not all that uncommon in basketball circles. And the knee is particularly susceptible. A bone bruise is a colloquial term, rather than a medical term, and is something of a misnomer. It is actually a break in the inner layer of bone, accompanied by bleeding from which it gets its name. Cortical (or compact) bone accounts for 80% of the weight of a human’s skeleton. It is highly organized, very dense and extremely strong. Cortical bone is mostly present in the shaft portion of a person’s long bones, such as the bones found in the arms and legs, where it is arranged in concentric layers that surround a central cavity that contains yellow bone marrow. It also forms the hard outer shell that covers cancellous bone. The primary functions it serves are support and protection. Cancellous (or spongy) bone makes up 20% of a human skeleton’s weight. It is far less organized, far less dense and far more porous than cortical bone, which gives it softer, weaker, and more flexible characteristics. Spongy bone is typically found at the core of vertebral bones in the spine and at the ends of long bones, underneath a hard outer shell made of cortical bone. Unlike cortical bone, it is not arranged in concentric layers but rather in plates of microscopic fibrous tissue, called trabeculae, that crisscross with one another in a honeycomb structure and are filled in with calcium to give them their strength. These fibers are interspersed with irregular cavities that contain red bone marrow, the site of production of blood cells. Contact between the end of the femur (thighbone) and the top of the tibia (shinbone) occurs at the knee joint. At the end of these long bones in the knee, the outer shell is made of a thin layer of cortical bone and the inner core is made of spongy bone. A bone bruise is an injury sustained to spongy bone, resulting in bleeding into the damaged area. This type of injury can be the result of highly compressive forces that are repetitively inflicted on a bone or the result of an acute trauma, where forces are not strong enough to damage the outer layer but are strong enough to damage the fibers in the spongy bone. When enough of the fibers break, a fracture of the bone occurs. But when a few of the fibers break, the result is a bone bruise. It may therefore be considered as a stage before an actual fracture occurs. This image shows a femur, and beside it a longitudinal cut which shows the medullary part of the bone that exhibits some broken bone fibers that are bleeding. Bone bruises are notoriously slow to heal. The body must first remove the calcium and damaged fibers from the area and then it can begin to rebuild new fibers and lay down new calcium, a process called remodeling. The process can take weeks, sometimes months, to complete, depending upon the type, severity and location of the injury. The treatment is often a combination of rest, medication to reduce pain, ice to reduce swelling, therapy to break up scar tissue and stimulate healing, and rehab exercises to ensure full range of motion. Unlike structural damage which requires surgical intervention, a properly recuperated bone bruise will typically heal well on its own, with no further consequences. A bone bruise can feel excruciatingly painful right up until the moment it completely heals, and since it’s not a true fracture, the bone is still safe to utilize. However, any further trauma to the injured area can cause greater injury and/or prolong the healing time. If the lesion is struck again after it is partially healed, the impact could damage new, poorly protected fibers that the body has just rebuilt. Thus, the body would have to stop its rebuilding process in the re-damaged area and again remove the fibers and the associated calcium before it can resume rebuilding. Wade reportedly re-aggravated his injury several times. To combat the injuries, Wade interspersed large periods of continuous play during the regular season with short intervals of rest. He also received platelet-rich plasma therapy late in the regular season to combat the bruises. He subsequently revealed after the season that two of the bruises had healed by the start of the playoffs, but a third – directly under the kneecap – remained a big problem throughout the playoffs, especially since that area was also being affected by patellar tendinitis. In revealing the tendinitis, Wade had for the first time hinted at possible chronic problems in his right knee as well. He went on to produce his worst-ever playoffs, at times becoming a liability for the Heat on the court, with better alternatives to a hobbled Wade relegated to the bench. His knee pained him so much that he even contemplated asking to play limited minutes in Game 7 of the Eastern Conference Finals against the Pacers before deciding to scrap the plan on the urging of head coach Erik Spoelstra. Wade kept grinding his way through. Wade had a large amount of fluid drained from the left knee the following day, then got more than three hours of treatment at the arena the morning of the game and about 4½ more hours of work done in the afternoon, going almost all the way up to the moment the Heat took the floor to warm up for Game 7. He needed treatment during the game as well, even missing the start of the second half. Despite the injuries to both knees, Wade played 39 minutes in the finale, scoring 23 points on 11 for 21 shooting. The late-season knee problems took some serious shine off a brilliant year in which Wade averaged 21.2 points, 5.0 rebounds and 5.1 assists on a career-best 52% shooting, as an emphatic answer to all the preseason skeptics who had begun to question his declining skills. Only Heat teammate LeBron James, Oklahoma City’s Russell Westbrook and the Los Angeles Lakers’ Kobe Bryant averaged as much in all three of those categories during the 2012-13 season as Wade did (with the latter two shooting at least six percentage points lower in doing so). Wade took a much-needed break from his typically hectic summer schedule this past offseason. The pain in his left knee eventually subsided. The lone remaining bone bruise in his right knee eventually dissipated. It was a surgery-free summer for Wade. To deal with the tendinitis, however, he again underwent OssaTron shockwave treatment in July 2013, this time on both of his knees. Wade said the results were largely favorable, and he was hopeful for similar relief to what he experienced after a similar round of treatment in 2008. Between the bruises, tendinitis and cartilage damage in his knees, Wade has had a lot through which to endure. He has played through pain for the majority of his N.B.A career (4). How much of that pain could have been avoided had he elected to repair rather than partially remove the torn lateral meniscus in his left knee back in 2002 is unknown. The majority of his ailments are very common both in professional sports and in the general population (5). His advanced age and the years of pounding caused by his aggressive style of play have undoubtedly exacerbated the problems. But the hope is that continued rest and rehabilitation, and an aggressive maintenance program, will return Wade to his explosive and dominant self, as the Heat try to immortalize themselves in basketball history as a three-peat dynasty. There’s reason for such hope. After a sluggish start to the 2012-13 season, during which time he was basically written off by the media and fans alike, he knees grew stronger as the season progressed and his explosiveness returned. He put forth some of the best basketball from December through mid-March seen in the entire N.B.A. Perhaps time, and patience, will enable him to do it again, this time during the ever more-so important playoffs. He is certainly giving it his maximum effort. He constantly undergoes stretching exercises, strengthening exercises, and various other therapies and treatments. He wears patellar tendon straps on both of his knees during games (which applies pressure to the patellar tendons and helps to distribute force away from the tendons themselves and direct it through the strap instead). He ices his knees constantly. He takes anti-inflammatory and other medications to cope with the pain when necessary. He is perhaps the N.B.A.’s greatest warrior. And that has made him perhaps the second greatest shooting guard in N.B.A. history. (1) Meniscal transplantation is a currently viable surgical alternative. The procedure has been performed on some professional athletes who have retired, such as football player Marshall Faulk, but never on an active pro player. There’s also some cutting-edge work being done all over the world in the field of articular cartilage generation. It is unlikely that Dwyane Wade wants to be the first N.B.A. player to have any of these still very new treatments. Given his age and contract, it is more likely that he would opt to walk away from the game at the point that he simply cannot play any further than it would be taking extreme surgical measures to extend his career. (2) Disease of the tendon is referred to as tendinopathy. Tendinopathy is a broad term that can refer to tendinitis or tendinosis. Tendinitis involves larger-scale acute injuries accompanied by inflammation. Tendinosis involves chronic tendon injury with damage to a tendon at a cellular level. While the majority of us utilize the term tendinitis as part of our nomenclature, it is quite possible that Dwyane Wade actually suffers from tendinosis. (3) Because the patellar tendon connects the patella to the tibia – bone to bone – it is sometimes also referred to as the patellar ligament. Ligaments connect bone to bone while tendons connect muscle to bone. (4) This post deals only with Dwyane Wade’s various knee injuries. Wade has endured many other injuries which have not been described in this post (e.g., his strained rib muscle that caused him to miss Game 6 of the 2005 Eastern Conference Finals against the Detroit Pistons, among other injuries including to his shoulder, ribs, hip, hamstring, calf, ankle, etc.). Among the many current N.B.A. players who have incurred meniscal tears include: Chris Paul, Derrick Rose, Eric Bledsoe, Jameer Nelson, Jeremy Lin, Russell Westbrook, J.R. Smith, Chris Budinger, Danny Granger, Matt Barnes, Metta World Peace, Al Harrington, Blake Griffin, Tyrus Thomas, Udonis Haslem, Solomon Jones, Andrew Bynum and Tim Duncan. The extent of the tear, the course of treatment, and the long-term prognoses of many of these athletes are in some cases known and in others unknown. Among the many current N.B.A. players who have suffered from patellar tendinitis include: Derrick Rose, Jeremy Lin, John Wall, Rodney Stuckey, Iman Shumpert, J.R. Smith, Joe Johnson, Ray Allen, Vince Carter, Danny Granger, Jared Dudley, Kawhi Leonard, Mike Dunleavy, Mike Miller, Antawn Jamison, Glen Davis, Kenyon Martin, Josh Smith, Pau Gasol, Andersen Varejao and Greg Oden. While the degree to which they suffer undoubtedly varies, most N.B.A. players will suffer from patellar tendinitis at some point in their careers. Among the many current N.B.A. players who have suffered from significant articular cartilage damage include: John Wall, Dion Waiters, Eric Gordon, Kobe Bryant, Carmelo Anthony, Danny Granger, Amare Stoudemire, Carlos Boozer, Kenyon Martin, Zach Randolph, Andrew Bynum, Greg Oden and Spencer Hawes. Most N.B.A. players will suffer some form of articular cartilage damage during their careers, which causes many high profile premature retirements (e.g., Brandon Roy). The sheer size of the list of former players with each of these types of injuries, as well as the high profile names on it, would shock you. Your author is not a doctor, nor is he privy to Dwyane Wade’s confidential medical files. He is just somebody with an inquisitive mind who has broken and battered several parts of his own body, many times intentionally and other times through sheer stupidity, and uses his mountains of available time in unemployment to study the human body, and in particular the knees (and spine).